“Crazy is as crazy does.” The 2015 Giro d’Italia may just have been the most lunatic Grand Tour in recent memory. The final week of this 21 day assumption-chucking race didn’t fail to disappoint. 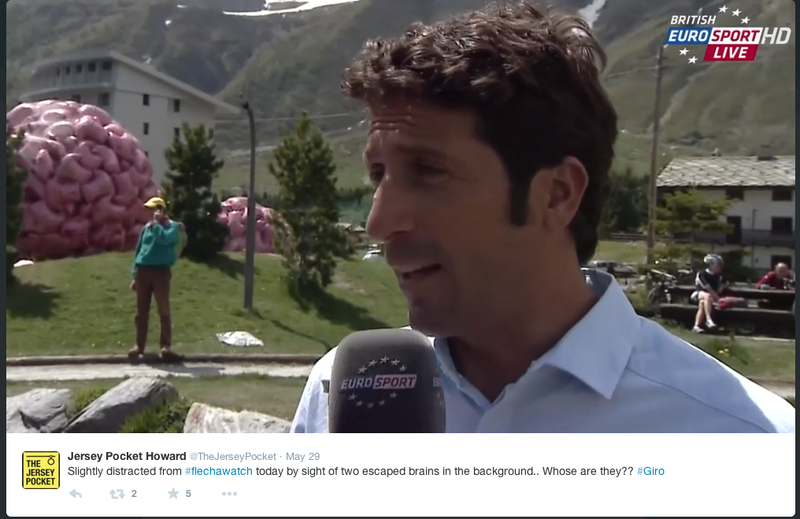 One simple screen-grabbed picture perhaps sums up the many aspects of this most unusual race best: Juan Antonio Flecha’s stylish looks, beautiful Italian scenery and what looks like two escaped brains roaming the parcours.. It’s the perfect metaphor really. The second rest day brought the long expected news that Richie Porte had abandoned ship and taken his much talked about motorhome back to training with Chris Froome. Commentators had wondered when Porte’s traditional ‘off day’ in this Grand Tour would come but in truth it would be quicker the look for the good days that the unlucky Tasmanian had enjoyed. The only silver lining for Team Sky is that he may be marginally fresher for the Tour now. Stage 16 was all about the infamous Mortirolo climb. With ramps approaching 18% in places it was expected to test the GC contenders again and we expected to see the select group test each other once more. But we should have guessed that the plot would not be as expected. Contador’s puncture a few kilometres before the base of the climb wasn’t caught in camera but the immediate attack by Katusha and Astana certainly was, prompting much tut-tutting about respecting the unwritten rules of not taking advantage of a leader’s mechanical. There was also a good dose of schadenfreude bandied about recalling Contador’s attack when Andy Schleck dropped his chain in the 2010 Tour. The upshot was that the maglia rosa started the climb 51 seconds behind Aru, Landa and the other big-names and, as was becoming usual in the latter half of the Tour, with no teammates around him. We were then treated to a masterclass of climbing by the man from Madrid. Passing rider after rider in his familiar out-of-the-saddle stance he caught the Aru, Landa, Hesjedal and Kruijswijk group half way up the mountain and, after the briefest of inspections of their various pain faces, accelerated away again in search of the stage win that has so far eluded him at the Giro. Aru, already struggling, immediatley crumbled in his wake and it was left to Landa to respond for Astana. He made it back to Contador before the top and sat on for long enough to save enough energy to be able to jump away before the line to win again, moving up to second place in the process. 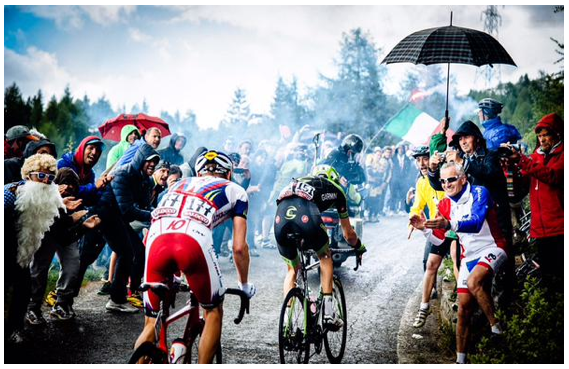 The Giro surprised us all again the following day by finally giving us an unremarkable stage. Long, flat with a bunch sprint win, which Sacha Modolo mopped up for the consistently impressive lamprey-Merida, who finished with four stage wins. ‘Normal Abnormal Service’ resumed on Stage 18, which finished just over the Swiss border in Verbania. By now, we Giro watchers were starting to suffer from a little bit of “incredible action fatigue” and the constant barrage of incident and intrigue was getting ever more complex to file mentally. Luckily the stunningly beautiful Italian Lakes soothed our fraying nerves until the Giro went crazy again in the last two hours of the stage. This time it was Landa’s turn to get caught behind a crash and Contador’s turn to thumb his nose at Astana as he promptly took off on a solo foray with over 45km to go. As if the massed team pummellings that we had seen already weren’t enough of a reminder of the bad old days of cycling, now we had GC leaders making wholly unnecessary long-range attacks over vast mountain ranges. At first it did look as though Contador might follow up the implausible with impossible and actually catch the break that was some 9 minutes up the road. He fell a little short but it was an impressive coup de grâce nonetheless. Philippe Gilbert attacked the breakaway for his second win – this time in the home country of BMC’s Swiss sponsors. Riders who suffer collapses and then ‘miraculously’ arise again, Lazarus-like, the following day have a bad rep in cycling and in Grand Tours in particular. Floyd Landis’ jour sans and subsequent jour avec beaucoup in 2006 is a day so pivotal to the current state of the sport that it should probably be celebrated on its tenth anniversary next year as the nadir from which we hope that we have now escaped. It shows how far we have come that someone would dare to do what Fabio Aru did on Stage 19 without apparent fear of being openly ridiculed. His flight up the last of three Cat 1 climbs that capped a massively long day bore no resemblance to the man who had openly cried ascending the Mortirolo on Stage 16, nor even to the man who not hold the wheels the day before. However far we have come, given his team’s history and such an incredible performance, questions should be being asked. But not it seems in Italy, where yet another win by a home rider was greeted with jubilation. Back up into second place – at the expense of team mate Landa whose lack of a contract with the Kazakh team next year was beginning to cost him dearly – he looked like a man ready to take the fight back to Contador on the final day of racing. Could he? Would he? We all put our disbelief on the shelf one more time and of course we hoped that he would. Because such a twist in the tail would be the proper ending for this utterly bonkers race. And we so nearly got it. The Colle delle Finestre – with it’s twenty-odd switchbacks and then (!) 8km of gravelled roads before a dip down and then the final ascent to Sestriere – proved to a fitting stage for the last meaningful action of the 2015 Giro. With silhouetted tifosi lining the ridges like the Zulu’s at Rourke’s Drift in the 1964 Michael Caine movie the unthinkable happened: Contador finally cracked. Kruijswijk attacked first, looking to keep the blue mountains jersey on his incredibly square shoulders by claiming the myriad points atop the Finestre – designated the CIMA COPPI award as this year’s highest point. Landa followed, as easily and effortlessly as ever and so did Contador. For about ten yards. Then he sat up and watched them go. ‘Biding his time’, we thought, ‘Doesn’t need to chase’, we said. Aru rolled up alongside, took a quick look and went off as well along with Ryder Hesjedal, who had been animating much of the last week of the race and, in doing so, was steadily climbing his way back up the top ten. Contador’s normally fluid style evaporated like a patch of rain on sunlit tarmac; suddenly he was pedalling squares, fighting the bike across the rough gravelled track just take it forward at all. Landa gained a minute and a half in no time and cruelly caught breakaway leader Ilnur Zakarin for the huge haul of mountains points at the raucous, snow-spattered summit. Aru & co topped out half a minute back and then we had the long, long wait for Contador as the others plunged down the other side seemingly intent on taking full advantage of what looked like a catastrophic collapse. The road up to Sestriere is littered with the memories of fallen hopes and, though not as steep, long or brutal a climb as the Finestre, it has been the graveyard of many a Grand Tour contender. Lance Armstrong muscled the climb into notoriety in 1999, announcing his return from cancer with a pulsating showing that many thought even at the time was too good to be true. 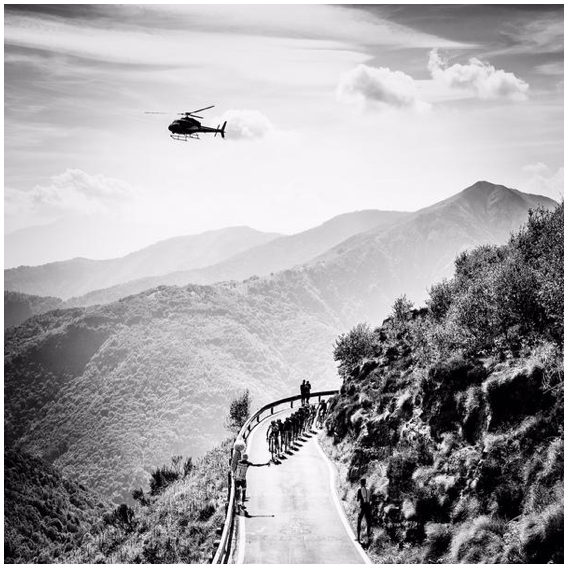 The average speed of the whole 2015 Giro has been worryingly high but the times up the climbs – even Contador’s motoring up the Mortirolo – have at least been within the realms of accepted feasibility. With a good ascent here (and no response from Contador) Landa, the strongest climber across the three weeks, could take the stage, the mountains jersey and maybe, just maybe the GC title as well. We saw thumbs going up in the Astana team car.. Contador was holding the gap as he took the downhill and valley road but could he withstand another ascent? Surely this was the moment that the whole crazy three weeks had been building too. A final, last gasp twist to cap it all..
We’d forgotten again though, in our excitement, that this is the Giro with no understandable rules. This is the Crazy Giro. Instead of seeing Landa push on up to the finish trying to claim three, two or even just one of the prizes that were within his grasp, we saw him slow down and start looking behind; ordered by the team car to wait for Aru and pace him up the early part of the climb before letting him take the win. In doing so Astana contrived to exchange a Spanish stage win, the mountains prize and an outside shot at the GC for just an Italian stage win. The final twist in this most overwhelming 3,486km roller coaster of a race was to totally underwhelm and baffle us in the last 4km. Contador, having never gone into full panic mode on the Finestre, rolled in two and half minutes back, with a handy amount still over second place Aru on GC. Sportingly, Astana rider Tanel Kangert, who had shadowed him the whole way down the Finestre and up to the ski station did not jump him on the line but instead withdrew gracefully and allowed the maglia rosa to cross the line alone for the cameras. It was a little (but very important) touch of respect in a race that has been noted for its lack of it. And that should be that. The best Giro I can remember; packed with incident and intrigue from end to end. A truly “Grand” Tour. I’m writing this as the peloton winds it’s way across the flat plain between Turin and Milan for the traditional ‘party stage’ with pink hair (really Oleg, there was no need for either that or for giving the finger to the world in your final celebrations) and prosecco to the fore before a last bunch sprint to settle the last jersey standings. But who knows. Perhaps Contador has stopped for a ‘natural break’ and Astana have put the hammer down.. Nothing would surprise me anymore. Crazy Giro. In the end there was a surprise – Etixx-QuickStep’s track star Iljo Keisse, who is more used to hand-slinging Cav round the Six-Day boards of Gent or Zurich, popped off the front of the circuit-hammering bunch with Luke Durbridge and stayed out to deny the very few remaining sprinters their last bit of glory. Like so much else over the past few weeks, it shouldn’t have happened. But it was wonderful because it did. I just hope that, like Chris Horner’s win at the Vuelta in 2013, this whole race is a wonderful aberration and not anything more sinister. The unnaturally hard racing, the incredibly high average speeds, the ups and down of Aru could all be signs of something being amiss. We hope not. We hope that the recent hauling of Astana in front of the Licensing Commission merely served to fuel their desire to show what they can do. They won the team standings by a clear 45minutes, doesn’t lose a single rider, won five stages, and bossed the peloton in a manner that Sky can still only dream of. It’s a testament to Contador’s still potent powers that he was able to resist them all. GC – Alberto Contador (TINKOFF-SAXO) 88:22:25; Fabio Aru (ASTANA) +1:53; Mikel Landa (ASTANA) +3:05; Andrey Amador (MOVISTAR) +8:10; Ryder Hesjdal (CANNON-GARMIN) +9:52. Points – Giacomo Nizzolo (Trek Factory Racing) – 181; Philippe Gilbert (BMC RACING TEAM) – 148. Featured Images from the incomparable Jered Gruber. Please check out his work. It is sublime. Oleg image via Tinkoff Saxo Twitter. This entry was posted in Giro dItalia, Pro cycling and tagged aru, astana, bmc, contador, crazygiro, Cycling, flechawatch, Giro, giro d'Italia, katusha, landa, porte, procycling, team sky, tinkoff. Bookmark the permalink.